My passport has finally a new passport holder. I bought it yesterday from Paperchase for £4.50. 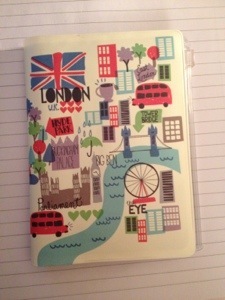 It is great because it has a separate ‘pocket’ as well as little card holders inside. Perfect to put my $ and € credit cards in there as well as my Frequent Flying card and my Airport Angels membership card. The next flight can come! This entry was posted in Shopping Haul, Travel and tagged passport, Shopping Haul, Travel on January 20, 2013 by NJ.